Rose Cottage, Withielgoose, Withiel, Bodmin, Cornwall, PL30 5NW, United Kingdom. Capillary Tube Supplies Ltd is a well established company specializing in the supply of thin wall glass capillary tubes (specimen holders) principally for x-ray diffraction analysis. X-ray Crystallography and X-ray Powder Diffraction methods are used in conjunction with Debye-Scherrer or Guinier cameras to produce photographs which can establish the structure of a wide range of materials. Particle accelerators are being increasingly used where greater energy and control can provide more definition of the deflection and scattering of the x-rays. 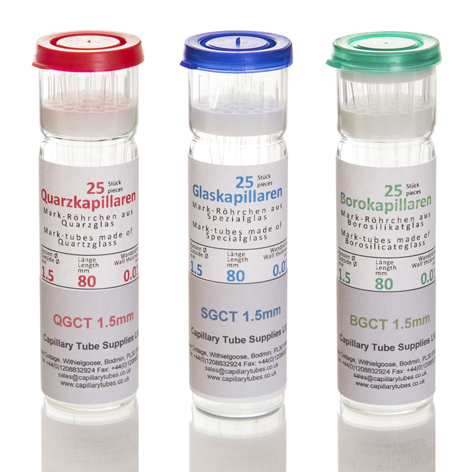 We supply glass capillary tubes in three different types of glass - Special Glass, Borosilicate Glass and Quartz Glass. We are approved agents for Glasinstrumentemachermeister Muller and Muller. Our stockholding consists of 15 different sizes in each of the three different types of glass, from 0.1mm to 3.5mm outside diameter. All are normally available from stock, and in addition, special sizes can be made to order.